Long Beach, Ca., April 1, 2013 – Tenneco’s Rancho® brand of performance suspension systems and shocks has announced the release of an all-new long-arm suspension system (Part no. 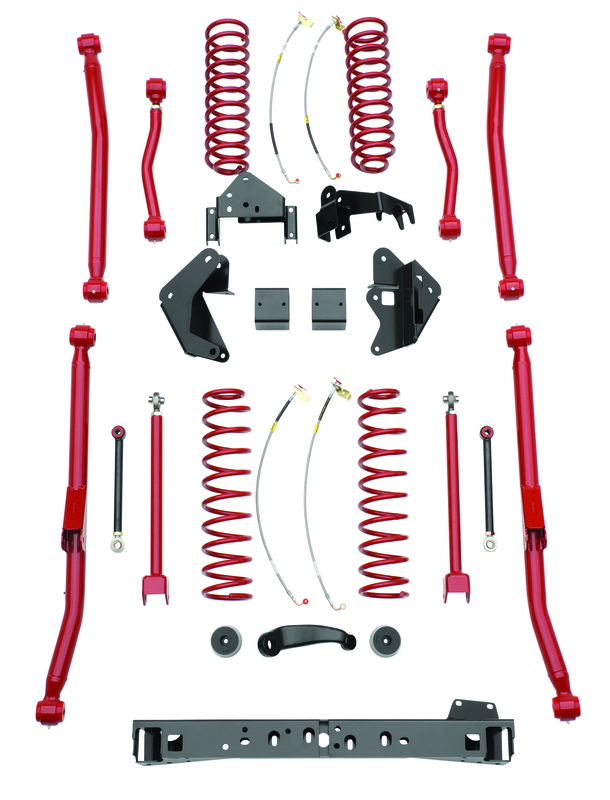 RS66105B with black arms/springs; RS66105 with red arms/springs) for 2007-2013 Jeep Wrangler JK vehicles. One of the world’s most recognized brands of off-road suspension components and accessories, Rancho is manufactured and marketed by Tenneco (NYSE: TEN). To deliver the ultimate steering envelope, added articulation plus increased ground clearance needed during demanding off-road riding, the Rancho 4-in. long-arm suspension system includes a front adjustable track bar that provides axle center adjustment plus extended length, quick disconnect front and rear sway bar end links for increased articulation. The new Rancho high-articulation front and rear long-arm design includes Rancho exclusive, heavy-duty tubular-style front radius arms that add exceptional strength and stability to the system. Providing added versatility, the front and rear upper links are adjustable, allowing for caster adjustment. Each kit contains a rear axle mounted track bar bracket that restores proper track bar angles. The new kit also requires a new integrated transmission crossmember (Part no. RS886101 for 2007-11 JKs; Part no. RS886102 for 2012-13 JKs) for use with the long-arm kits (RS66105/RS66105B). The Rancho transmission crossmember moves the lower control arm mounting points up, adding increased ground clearance for the lower control arm. Each new Rancho long-arm kit includes front and rear coil springs, upgraded front and rear bump stop spacers and front and rear extended length brake lines to accommodate the increased axle travel. The new Rancho kit fits up to a 37-in. tire. Any of the Rancho performance shock absorbers (RS9000XLs, RS7000MTs and RS5000s) work with this system. All Rancho brackets are manufactured using high-strength, low-alloy steel. No exhaust modifications are required when installing the new Rancho system on 2007-2011 Jeep Wrangler JKs. On 2012 and 2013 Jeep Wrangler JKs, the system requires the use of a Rancho cross-over exhaust pipe kit (RS72003) or a new front driveshaft. The Rancho cross-over exhaust pipe kit prevents contact between the cross-over pipe and the front driveshaft, allowing for optimal driveshaft clearance and more suspension down travel than exhaust spacers. The system is compatible with the Jeep JK Electronic Stability Control System. Each Rancho suspension system includes highly detailed, full-color product installation guides. Some cutting is required during installation. The latest long-arm Rancho system for 2007-2013 Jeep Wrangler JKs is backed by the Rancho brand’s limited lifetime warranty, see www.GoRancho.com for additional details. To learn more about the Rancho system for 2007-2013 Jeep Wrangler JKs, please visit www.GoRancho.com, contact your nearest Rancho dealer or call 1-734-384-7806. To locate your nearest Rancho authorized dealer, please use the “Where to Buy” tab at www.GoRancho.com to generate a list of nearby stores in your selected regional and other online retailers. The Rancho suspension and shocks brand is one of the performance aftermarket’s leading brands. The Rancho brand of performance suspension and shock absorbers is manufactured and marketed by Tenneco (NYSE: TEN) and headquartered in Long Beach, Calif.
Tenneco (NYSE: TEN) is a $7.4 billion global manufacturing company with headquarters in Lake Forest, Illinois and approximately 25,000 employees worldwide. Tenneco is one of the world’s largest designers, manufacturers and marketers of clean air and ride performance products and systems for automotive and commercial vehicle original equipment markets and the aftermarket. Tenneco’s principal brand names are Monroe®, Walker®, XNOx™ and Clevite® Elastomer.